The foundation of our program is "Family." The bond that our players and coaches have amongst each other goes way beyond the soccer field. Players interact like sisters and form life-long friendships. As coaches, our roles expand beyond the field. We build an environment where every person is treated equally. We serve as coaches, friends, "father-like" figures and guardians. Our players know that they can rely and communicate with us at any time. Since the team spends so much time together and they enjoy each others company, it creates one big family atmosphere. The relationships and the trust that is built throughout the years forms a lifetime connection to each other and the program. Family for us is not about whose blood you have but who you care about. Pride is striving to preserve the tradition, foundation and history that was built by the strong women who were among the first to wear Marquette University on their shirts. They did it in order to pave the way for their future sisters fully knowing that their names might be forgotten, but ever willing to continue to provide the path in which today's women continue to walk upon. 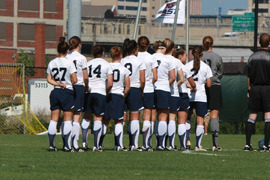 Our players take a lot of pride in being part of Marquette Women's Soccer and all it stands for. This program has built a strong history of success that goes beyond the soccer field. Playing and representing Marquette, respecting our former players, and honoring each of our families and friends is very important to us. Yes, winning is important, but how we prepare, interact and represent ourselves and Marquette every day is what we strive for. We strive for excellence. Whether it be in the classroom, in the community, on the field, or in life. We have built high standards and continue to live up to them. Excellence isn't measured in wins and losses but how we conduct ourselves by giving 100 percent at all times in everything we do. The players work very hard in the classroom and graduate prepared to take the next step in life. Our philosophy is that we always work hard and be consistent in our beliefs. Experiencing and playing at the highest level every day raises the bar for all of us and we embrace those standards. A group of 10 seniors embraced, trusted and believed in each other and us young coaches as we paved the way and started building a winning tradition back in 1996. We created an environment where people are most important and "Family" is our foundation. Our team's strength is in numbers where every individual matters through who they are and how they excel. This principle has grown stronger over the years. 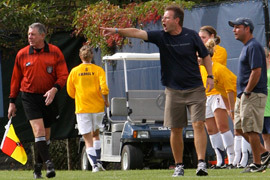 The building history of Marquette Women's Soccer, the tradition of success that continues to grow year after year is due to the high standards we set in the classroom and on the playing field. Highly motivated academically and when it comes to competing against other teams, those players have found success throughout their careers. Many games and championships have been won but our tradition is much deeper as all of our players have found success in life. 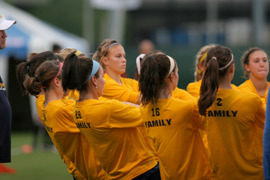 They have been enriched by their teammates and coaches and build lasting memories at Marquette. We are fortunate to have been recognized as a top 20 program consistently for nearly 10 straight years and that goes back to the committed, driven women that have come into the program and made Marquette a special place. They continue to carry the torch that was lit for them and they are very proud of that tradition and will continue to pass it along to the next generation of players and family members. Our team is only as strong as it's foundation and our tradition and the contributions made by every person involved with the program continues to grow stronger every day.